This was everything she was looking for. This moment was perfection. Her and the moon god would become one and live happily ever after. The moon god was perfection and he loved her. She was his now and forever. All the other gods wanted her, but he fought for her and won her. Now that the full moon was shining brightly in front of her, it was time to say goodbye to the forest that she grow up in. Yes, she would miss the little forest creatures and the rocks and the tree and the butterflies, but true love awaited her! She was willing to sacrifice everything to finally be loved and wanted. "Lillian..." a voice whispered her name amongst the blowing wind, "Come to me my love!" A smile as bright as the moon spread on her lips. She sighed and let her wings open. The butterflies began to dance around her and say goodbye. The time had come to leave her home and enter into her destiny with the moon god. She lifted from her feet and grabbed a hold of her love's hand. 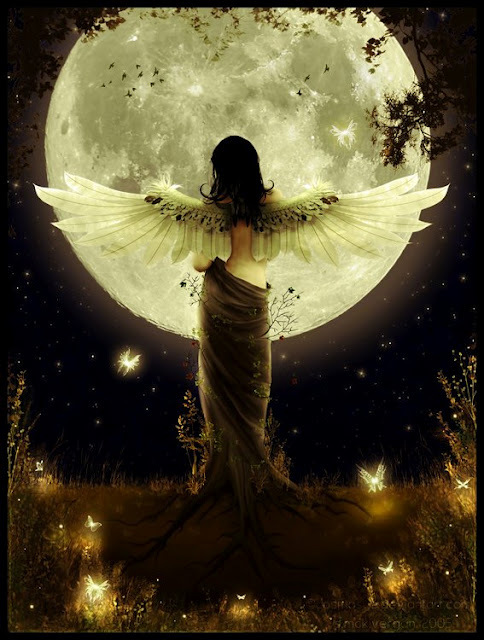 The moon god looked at her in awe, "My goddess. You are so beautiful!" With a blush she touched his cheek, "Oh do kiss me my beloved." Lillian startled awake. She looked around for her god and then the reality dawned on her, "Damn it." She muttered and pushed herself up. Another lovely dream destroyed by the sound of her mother. Why must the dream always end when she was about to venture into the best part! "LILLIAN! I NEED TO USE THE BATHROOM!" Boomed the voice again. "COMING!" Hollered Lillian. Quickly, she slipped on a pair of slippers and ran down the stairs. She loved her mother and would do anything for her. Yes, her mother was sickly and needed her, but she felt locked in a fortress of solitude. Running down the steps to her mother's room, she tried to keep the image of her moon god in her head, but his face was quickly fading. This saddened her, but her mother needed her; dreams could wait. In this reality, she gave up on true love and a social life to the happiness and well being of her mother. Oh that was fun! I liked the ending very much! Anachronist, I'm glad you liked it! I really love the ending too. Oh poor girl. That is a feeling to have. She is so good to her mom. I hope one day she gets her moon god. I hope so too Melissa! Theres a secret message (not intended) that sometimes you need to sacrifice dreams in order to do good.